Based on the huge success of its PCM-D1 and PCM-D50 portable audio recorders, Sony has introduced the smaller and cheaper PCM-M10. Like its bigger siblings, the PCM-M10 body is made of aluminum and feels solid and substantial in the hand. At roughly 4.5" x 2.5" x 0.75," the PCM-M10 is truly palm-sized. Its buttons are crisp and responsive. Its layout is clean and coherent. The PCM-M10 back-lit orange display with black lettering is large and legible -- virtually the same size as the PCM-D50 display. Sadly for this writer, the M10's "Divide" function is not available as a free-standing button like it is in the other recorders -- it is now buried in the main menu. What was the Divide button is now a T-Mark button. an Operating Instructions Manual in English. This is a very good assortment of included accessories, especially at this price point. The wired remote is a particularly nice touch. A carrying case and folding tripod are available as optional accessories. The PCM-M10 is easy to use. 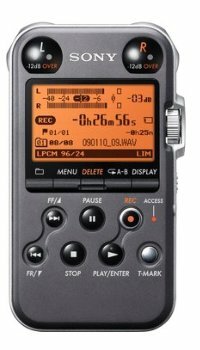 If you've ever operated a recording device of any kind and are comfortable with the file/menu interface on a computer, you will not have a problem using the PCM-M10. Why are these improvements significant? The other models feature only WAV recording. The other models don't have a speaker monitor, so with those you must always use headphones or external speakers to check your recordings. An optional wired remote control is available for the D50, none for the D1. In the other models, you must manually switch between the built-in flash drive and your memory card, thus interrupting work flow. In short, the PCM-M10 is a handier device than its bigger siblings. The PCM-M10 comes with a 4GB built-in flash drive and a microSD/M2 slot for up to 16GB of extra storage capacity. The PCM-M10 has a very fast mini USB 2.0 port, 1/8" stereo line-in, mic and remote inputs and a combination 1/8" line out/headphone jack. The battery life of the PCM-M10 is truly amazing, beyond outstanding. It lasted 43 hours (that's right, 43 hours) during our battery life test. Very Good/Excellent. Check out our PCM-M10 noise floor samples and compare them to the others. To our ears, the PCM-M10 offers some of the cleanest sound you can get for the price. 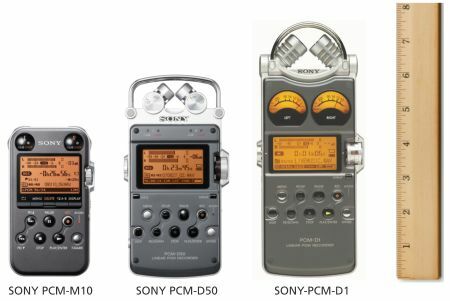 With the PCM-M10, Sony has retained the best features of the PCM-D1 and PCM-D50, like rugged construction, user-friendly operation, 96 kHz 24-bit recording, and generous storage, and enhanced it with even more conveniences like MP3 recording, a speaker monitor, cross-memory recording and an included wired remote -- all at a lower price. We are happy to add it to our selection of portable recorders.